When Georgia Calder first rode Pixie, the horse didn’t even know how to step over a pole on the ground. She could not canter more than three strides. Why? Pixie had just finished her career as a pacing Standardbred racehorse. It had only been days before that she’d raced her last race. Pixie was too slow and her owners wanted to retire her. When they found Georgia, they gave her the horse. Time passed and as Georgia worked with Pixie an idea began to grow, she would take Pixie to the country’s top equine event – the Horse of the Year show in Hastings (Georgia and Pixie live in New Zealand). Many people believe Standardbreds can’t compete in jumping and dressage events. They just don’t have the ability or correct gaits – especially if the horse is a pacer. What does it mean for a horse to pace? First let’s look at the trot. 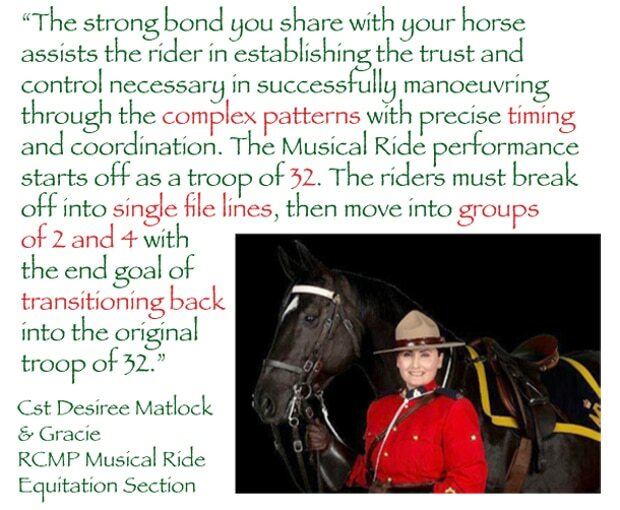 To find out more about Standardbreds, trotting and pacing, click here. Horse trotting with diagonal legs moving in unison. In the trot, the horse’s legs move diagonally in a two-beat rhythm. Math Talk – diagonal: A straight line inside a polygon that goes from one corner to another. The two corners must not already be joined by an edge. See the image below. When a horse trots, if the front right leg is forward, the diagonal leg, in this case the left hind leg, is also forward. When the front right leg goes back, the left hind leg also goes back. Now – for the pace. The pace is a lateral movement. When a horse paces, the front leg moves in unison with the hind leg on the same side. 1. Imagine a horse is pacing. If the left front leg is back, which hind leg will also be back? 2. The black horse in the photo above is trotting. If the left hind leg is back, which front leg will also be back? Math Talk – lateral: lateral refers to the side of an object. Not only has Georgia had to train Pixie to jump – first she had to train her to trot and canter! Training a horse takes a lot of time, patience and hard work. To help fund her dream, Georgia set up a Facebook page, A Standardbred’s Journey to Horse of the Year, the page now has over 1,600 followers. In New Zealand, a horse’s height is measured in centimetres. Pixie’s height is 162 cm. When converting the height of a horse from centimetres to hands, sometimes people will round the number of centimetres to the nearest 1’s place and say that 1 hand = 10 cm. Not rounding the number of centimetres results in 1 hand = 10.2 cm, which is more accurate but makes calculations more difficult. Math Talk – round: Rounding means reducing the digits in a number while trying to keep its value similar. The result is less accurate, but easier to use. 3 a. Calculate Pixie’s height in hands using 1 hand = 10.2 cm. Round your answer to the nearest 1’s. b. Calculate Pixie’s height in hands using 1 hand = 10 cm. Round your answer to the nearest 1’s. 4. In what year did Pixie arrive at Georgia’s farm? 5. How many weeks after her last race did Pixie arrive at Georgia’s farm? Georgia rode Pixie for the first time on 18/11/11 and jumped her for the first time on 21/11/11. 6. How many days elapsed between Georgia first riding Pixie and their first jump? In June 2012 Georgia and Pixie won their first event ribbon, a 6th place. The jumps were set that day at 85cm! 7. How many months had passed between the time Georgia first got Pixie and they won their first ribbon? Georgia and Pixie are entered in 3 classes at Horse of the Year show. Two of the classes will have jumps set to a maximum height of 110cm. 8. How much higher will Georgia and Pixie have to jump in these two classes than in the show in which they won their first ribbon? In the third class, the jumps will go as high as 115cm. 9. How much higher will Georgia and Pixie have to jump in this class than in the show in which they won their first ribbon? 10. Can you think of more than one way to calculate this difference in height? The Horse of the Year show takes place from 18/03/14 to 23/03/14. 11. In what month will Georgia and Pixie be competing at the Horse of the Year show? Here is a great slideshow with music showing Georgia and Pixie working together towards Georgia’s dream of riding Pixie in the Horse of the Year show. Will you continue following Georgia and Pixie’s story on their Facebook page? We’ll be cheering for you Georgia and Pixie! Answer: The left hind leg will also be back. Answer: The right front leg will also be back. Answer: 162 ÷ 10.2 = 15.88. Pixie is 16 hands high. Answer: 162 ÷ 10 = 16.2. Pixie is 16 hands high. Answer: Her last race was on November 10, 2011. She arrived at Georgia’s on November 17, one week later. Answer: 21 – 18 = 3. Three days elapsed between Georgia first riding Pixie and their first jump. Answer: November 2011 to June 2012 is 7 months. 8. How much higher will Georgia and Pixie have to jump in the Horse of the Year show than in the show in which they won their first ribbon? Answer: 110 – 85 = 25. They will have to jump 25 cm higher than in the show in which they won their first ribbon. Answer: 115 – 85 = 30. They will have to jump 30 cm higher than in the show in which they won their first ribbon. Answer: 115 cm (the maximum height of the jumps in question 9) is 5 cm more than 110 cm (the maximum height of the jumps in question 8). Once you know the answer to question 8 is 25 cm, the answer to question 9 is going to be 5 cm more, or 30 cm. PreviousPrevious post:Antique Sleigh RallyNextNext post:2014 is the ‘Year of the Horse’!